Being able to effectively manage and control the information for your clients is a critical part of operating your staffing company. 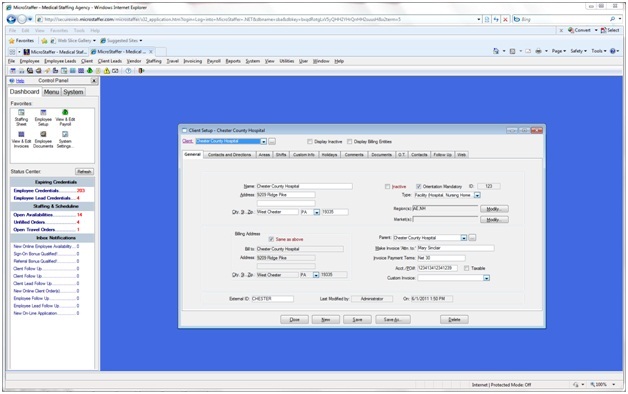 MicroStaffer's client setup window allows you to configure and maintain data based on client types such as Nursing Homes, Schools, Hospitals or individual patient information. MicroStaffer allows you unparalleled ability to manage and retrieve critical information on your clients using a visually intuitive and user freindly tab design. Enter information such as client address, department managers and contacts, phone and fax numbers, e-mail addresses, billing rates and, in the case of patients, individual patient information. Create Custom Info fields that flow into staffing and reports. Scanning of Documents into PDF format. E-Mailing of Documents in PDF format. Mailing label and form letter generation from Client data using our built-in Mail Merge processor. Like every feature in MicroStaffer client setup is intuitive and user friendly.